Millions of music fans use Bandsintown to discover shows, buy tickets and share concert information every month. In an industry where gross ticket revenue worldwide is up nearly 30% and touring has become the main source of artist income, Bandsintown has become a key promotional tool in sending more fans to shows than any other app. Bandsintown provides a range of artist tools that you can utilize to engage with your existing fans and to reach new concert-goers. This section highlights five things you can do right now to get the most out of Bandsintown. Bandsintown automatically generates notifications to your Trackers via email, mobile notifications and Facebook notifications. If you use Auto Announce or Twitter sync, Bandsintown also generates notifications to your fans through your social network whenever you announce a new concert date, helping to ensure they never miss any of your shows. 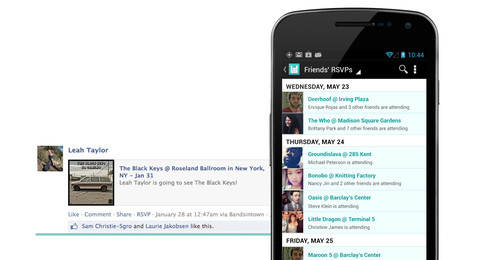 Every time someone RSVPs to your show, Bandsintown helps it to reach more concert-goers. A deep integration with Facebook shares the event amongst friends, and intelligent recommendations within Bandsintown help turn your fans into recommenders just by RSVPing. We are an aggregator of concert information and we curate from hundreds of sources worldwide – mostly primary ticket sellers and booking agencies. We use these dates as the foundation, and give artists the option to edit and/or add additional dates to the system through Bandsintown Manager. Our ticket links go directly from your artist page to the ticket company, where fans can purchase directly. Once you install our apps, your dates will then sync across your Facebook page, website, and Twitter feeds so you can cover your online presence using one tool. Through Bandsintown, your fans will find you and be able to easily share with their friends. STEP 1: Add the Bandsintown Manager on Facebook. You can also download Bandsintown Manager on iOS or Android. STEP 2: Upload in Bulk! Add your events using our guidelines to ensure data accuracy and send it to us -- we'll upload them for you. A lot of your current fans are already using Bandsintown – we push existing and new fans to your gigs no matter where you live on the web. However, many of those fans might not have Tracked you on Bandsintown. Once a fan becomes your Tracker, they will always receive alerts when you play in their area. STEP 1: Add the Bandsintown Tour Dates Widget to your website or blog to automatically sync your tour info across the web. STEP 2: Add links to your tour dates directly from your YouTube videos to encourage your fans to Track you. YouTube Cards make this easy, and Bandsintown is an approved retailer. Add Bandsintown to your official website, Tumblr, or WordPress site by visiting this URL, insert your artist name, and copy and paste the code into your website. Create a Wikipedia page for your band, and link your official website to your Wikipedia page. Ensure you have a MusicBrainz ID, and link your official website to your MusicBrainz page. Once you've completed these steps and Google indexes your website, your tour dates will be served up in rich list search results, as shown below. Building Trackers on Bandsintown is great way to connect with ALL of your fans, not just a certain percentage. Think of Bandsintown Trackers like an extension of your mailing list. Every time you have a new a show in their area, your Trackers will be notified. It’s important you let fans know how to never miss your shows! STEP 1: Add the Track Button to your website. Want to know how many Trackers you have already? We have a great way for you to get in touch with the fans that have RSVP'd to your shows. You can remind fans to grab their tickets for the show (make sure to include a link! ), invite fans to a pop-up show at a record store, or remind fans to stop by the merch booth during the show. Fans who have RSVP'd to a show will receive this message as both a push notification from their Bandsintown Concerts mobile app and an email. STEP 1: Go to the Post to Bandsintown section in Bandsintown Manager. STEP 2: Select in the drop down menu which event you would like to post your message to the corresponding RSVP's. STEP 3: Write your message and send it off! After sending the message, you can learn more about it's reach and open rate by clicking on the Insights button in Bandsintown Manager. You can create a message in Bandsintown Manager that will show up to ALL of your trackers in the Bandsintown Concerts app. You can announce a new tour or album or share a photo of you working hard in the studio. This will help you further engage with your fans and get them excited to come see you live. STEP 1: Go to the Post to Bandsintown section in Bandsintown Manager and select Post to Trackers from the drop down menu. STEP 2: Write your message and don't forget to include a photo! STEP 3: Check out the impressions and likes on your message through the Insights tab in Bandsintown Manager. For more info on these features, check out our help articles for Post to Trackers and Message RSVPs. We have a lot of information to share with you! Just click the Insights tab in Bandsintown Manager to get started. 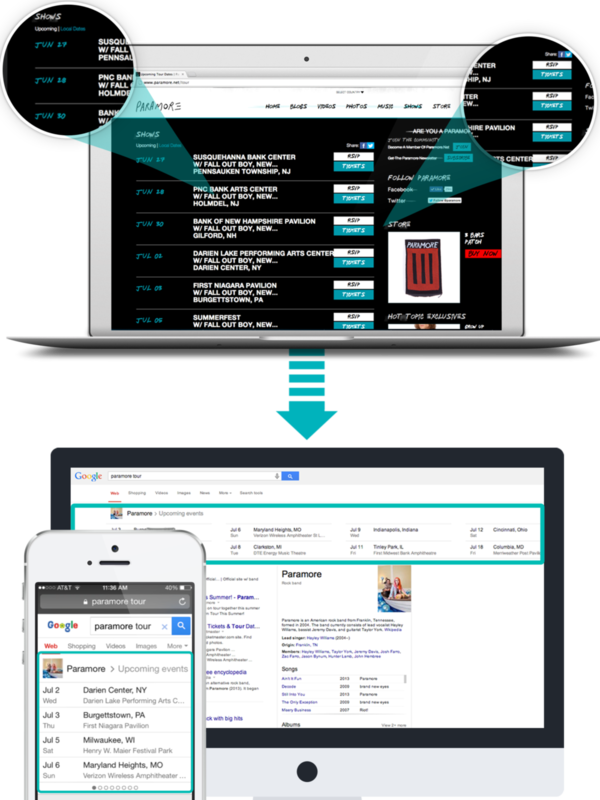 Our Analytics tool will help you to review concert-going trends & assess local fan demand.